Little Button is a delightful tiny children's boutique that is bursting at the seams with a large collection of children's clothes , traditional gifts and cards . 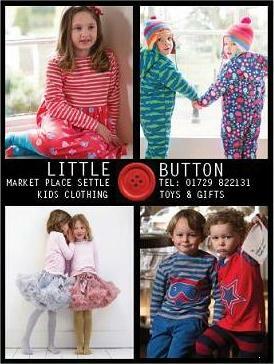 We are proud to be stockists for local organic children's wear brands Piccalilly & Dot&Co. Kite , Bob & Blossom , Powell Craft and Lottie Nottie are just a few of the other brands we stock .